Our guests in The Sustainable Hour on 5 April 2017 are Steven Reddington, senior environmental planner at Barwon Water, Erin Lewis-Fitzgerald, new editor of Slow Magazine, Danny Kennedy, and managing director of the California Clean Energy Fund. We also play a clip from this week’s Q&A on ABC with federal energy minister Josh Frydenberg and former Danish prime minister Helle Thorning-Schmidt – and with June Norman who campaigns to stop the Queenland coal mine projects by, for the first time in history, taking climate change arguments to Australia’s highest court. Where the federal government is failing, business and local government is leading. For Barwon Water, a new 1MW solar plant at Black Rock is part of the organisation’s broader plan to shift to 100 per cent renewables by 2025. Steven Reddington, Barwon Water’s senior environmental planner, joins us in The Sustainable Studio to explain to us how this will be rolled out. The plan is kickstarted with a 2,880-panel solar array at the Black Rock environmental precinct which will feed renewable energy directly to the water reclamation plant — Barwon Water’s most power-hungry asset. The project will generate around 1,300,000 kilowatt hours of electricity — sufficient to power about 300 homes — and save around 1,500 tonnes of CO₂ emissions annually. The solar project will save more than $130,000 in annual operating costs; more if grid electricity prices rise. The project is expected to pay for itself within 11 years. The solar farm will mean about 13 per cent of the treatment plant’s electricity is supplied from a renewable source. Wannon Water should soon be powering the water and sewerage treatment plant that services the regional city of Portland entirely by wind energy, with the construction of an 800kW wind turbine set for completion mid-2017. 13 minute radio interview with Slow Magazine’s new editor, Erin Lewis-Fitzgerald – a social entrepreneur and a maker and re-maker of fun things. She is also the founder and managing director of Bright Sparks Australia. Apricots, cinnamon, honey, walnuts and pistachios: oh yes. 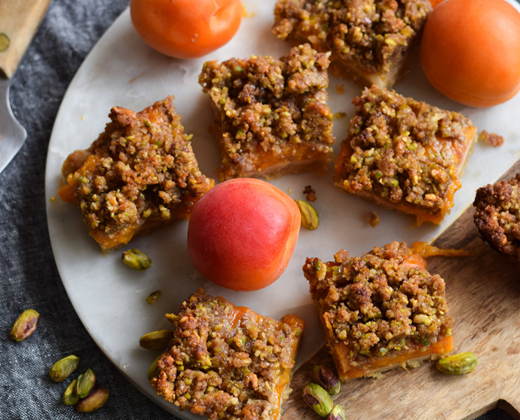 These apricot baklava bars are perfect for breakfast, and they’d be a comforting, sweet treat to take round to a friend’s house, too. Best of all: they’re gluten-free. 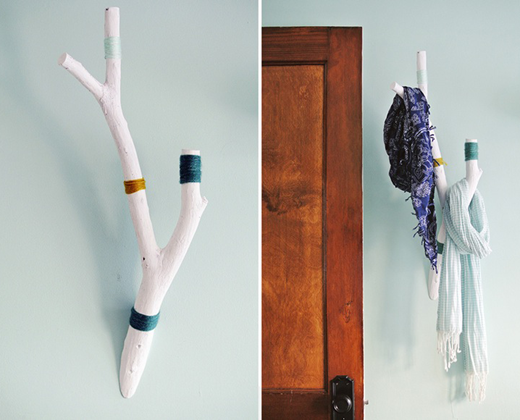 Bring a bit of nature indoors with these DIY wall hooks made from tree branches. If you don’t have any branches handy, it’s a good excuse for a neighbourhood foraging expedition. Zero waste + fab style = win win! 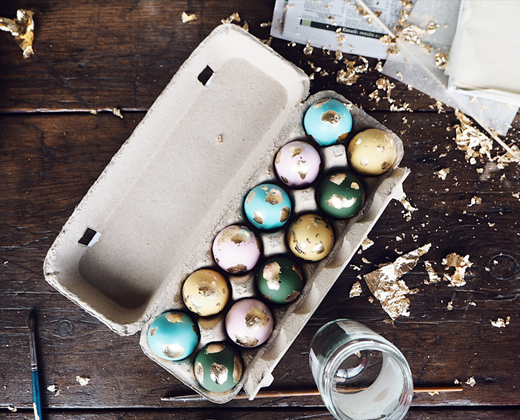 An Easter tradition gets a glamorous, Slow update with these gold-speckled Easter eggs. Make your own with this step-by-step guide. The challenge is keeping them in once piece, once they’re found. Love beauty products but not the plastic packaging? Mokosh do, too. 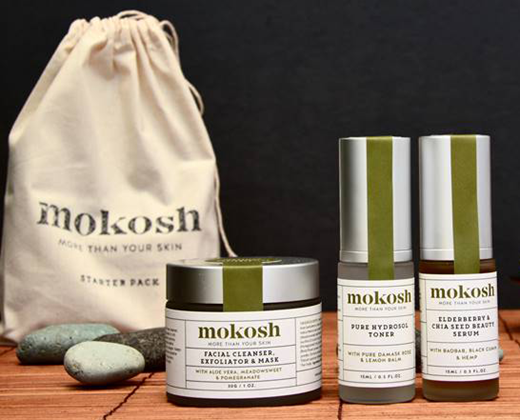 We’ve got five gorgeous starter packs to give away, which are organic, preservative-free, and plastic-free. » email your details to enter. “My background is really sort of an energy geek from way back, working on climate issues for decades now, and in the most recent decade or so, I’ve been an entrepreneur in America starting solar companies and now running a fund called the California Clean Energy Fund which is a fund that supports start-ups to succeed in the clean energy space. We have a network of incubators and accelerators around the world. We also have a $24 million dollar fund that I manage that goes to small early stage companies as investments. So I came to Australia because I’m an Aussie and read about and heard about the Adani issue and was sort of outraged that we’d be going backwards so far and fast in pursuit of this one crazy megamine which I think is a very bad business opportunity in the first instance, but obviously also a kind of crime in terms of the carbon potential and the pollution – and the impact on the traditional owners who oppose it, and so on. I feel like in my lifetime, one of the great moves that Australia has made is to somewhat respect native title and aboriginal land owners, and to hear that they are trying to gesump that native title through a change to the Native Title Act for this, is sort of one of the last straws – but also, to be honest, I think the idea that you’re saying government would consider giving a billion dollars – taxpayer dollars – to this mine proposal as a free gift, basically, is an outrage in this day and age. I mean, the truth is the coal industry is crashing. It has had over a century of subsidies from government, mostly in the externalisation of its true cost, like the air quality impacts it creates, and the climate change that it causes. But to imagine that we also give it free cash out of the Australian taxpayer’s pocket is ridiculous when there are so many better investments that the Australian government COULD be making than this. What is your advice to us Australians? You are going back to America now, but what’s your advice to us, and what are you going to do about it yourself when you are back in America? “I will try and keep up the pressure, the same way as I’d advice your listeners to let financiers know about what a doon-doggle this is. In Australia in particular I think right now getting Westpac to show that they won’t finance the last possible leg standing for domestic finance of scale. NAB, National Australia Bank, has already said clearly a no. And Commonwealth Bank and ANZ seem disinclined to do anything with this mine. We need to get Westpac out of it. So I think that is the first thing to do. If your listeners have accounts with Westpac, they should go in and talk to their branch manager about it, they should let them know. They should go to the StopAdani website for recourses, to join a group and get involved, maintaining and building pressure on Westpac. And then I also think they should stay in touch with the Stop Adani campaign and see what other political and financial leverage there are. I do think that financial leverage is where this thing will get killed. I mean it when I say that this thing is very uninvestable. As someone who does this now as a job, investing in energy start-ups, I can assure you coal markets are pretty grim. Right now, new coal mines are particularly hard to finance. You can look at Bloomberg’s New Energy Finance website today for a story about just how difficult the funding for a thermal coal plant is. For Adani to add 60 million tonnes [of coal] a year, or even 25 million tonnes a year, would just create more of a glutch on the market and reduce the profitability further. Already most of these mines are running near a loss. One of the political impacts that Australia has to watch out for – the Law of Unintented Consequences – is that if they open Adani in Queensland and start exporting tens of millions of tonnes of thermal coal from north in Queensland, the New South Wales coal mines would be very badly inpacted. I think you will see a lot of job losses in the Hunter, and that’s sort of a crazy Faustian bargain to close down existing jobs and existing mines that we are trying to just phase out gradually, and then instead open a new one which is probably going to become a stranded asset if it were to begin – I don’t think it will ever it’s life. That’s what I talked about [in Melbourne] on Friday: the fact that the Indian government is also pursuing a phase out of coal. Just like the United Kingdom, the United States, China and most major economies have done. The first stage of that phase is to shift to domestic supply of coal, and in India there’s a lot of coal and it’s actually much cheaper to produce that the Adani coal which is to be exported to India. The Indian minister for power, Piyush Goyal, is on the records for saying they want to stop import of coal within three years, and meanwhile they have a thing they call the National Solar Mission which is massively building up solar in the country. They have already built 10 gigawatts in three years from a standing start – and they intend to build 100 gigawatts over the next five years, by 2022. And 100 gigawatts is like a 100 large scale coal thermal plants – it doesn’t have the same capacity factor but that’s a detail, I think your listeners can understand it is a massive build-out on foot in India of clean energy, and wind also as well as solar. For the first time in history, Australians have the opportunity to take climate change arguments to our country’s highest court. The campaign started on 30 March and will end on 29 April 2017. On 4 April 2017, 388 supporters had so far raised $27,742 of the $60,000 target – with 25 days left. “It’s taken us years to get to this point. And we can’t do it without your urgent support, as our funds have been exhausted. Our application for special leave has been filed with the High Court to appeal the Court of Appeal decision with respect to the climate change impacts of the Alpha coal mine. If we win, it will confirm that decision-makers in Queensland have to consider the environmental harm from large coal mines on our climate and the Reef. Please, help us take Australia’s first climate case to the High Court by making a tax-deductible donation to EDO Qld today. As India intensifies efforts to boost renewable energy, the Australian Government’s case for it being an economic and moral destination for Queensland coal is falling apart. Along with vast sums of taxpayer money being handed to Indian energy giant Adani being bound for tax havens, the Government talking point about Australian coal being the ethical choice for India as it is less polluting than other sources has collapsed with the news that Adani plans to send poor-quality high-ash coal to India while exporting the marginally less polluting variety to better markets in Asia. The world’s biggest coal exporter has a problem. Demand for the dirtiest fuel is on the wane. The International Energy Agency — which has tended to overestimate coal production, and underestimate renewables — doesn’t expect consumption to regain its 2014 levels until 2021. Investment in new mines is “drying up,” according to its latest market forecast. Muhammad Yunus, the Bangladeshi Nobel peace laureate and micro-financing pioneer, echoed Thorning-Schmidt when he said Australia’s transition from fossil fuels depended on “the strength of the commitment” to renewables. Once the objective was clear, he said, the necessary technology would follow, pointing to the uptake of solar energy in Bangladesh. #qanda So refreshing having frank discussion of 100% renewable energy, #climateemergency, #climate refugees and massive wealth inequality. Rapid change is necessary for a safe climate future. If it is cheaper to use renewable energy people will adopt it. The more renewable energy is adopted the cheaper it becomes. Municipalities like Noosa, Byron Bay & Nillumbik are working to emit zero carbon emissions within 10 years. Politicians will act if they see their constituents choosing RE. Al Gore’s TED talk Feb. 2016 explains how the necessary speedy change could happen with the business opportunities RE offers.